CORRELATION BETWEEN JAK2V617F MUTATIONAL BURDEN AND THE DEGREE OF ANGIOGENESIS IN THE BONE MARROW OF BCR-ABL NEGATIVE MYELOPROLIFERATIVE NEOPLASMS. Liana Gercheva , Antonina Zhelyazkova, Ilina Micheva, Neli Zgurova, Maria Tzaneva, Georgi Balatzenko. Clinic of Hematology, Medical University, Varna, University Hospital "St. Marina", Varna, Bulgaria. JAK2V617F mutation is a well-recognized feature in most Ph-negative myeloproliferative neoplasms (MPNs). An activated bone marrow (BM) angiogenesis has been established in these disorders as well. Consequently, the rational question is to ascertain a possible relation among JAK2 mutation, morphological features and angiogenesis in MPNs bone marrow. Aim: To assess bone marrow microvessel density (MVD), bone marrow cellularity and fibrosis in newly diagnosed patients with BCR-ABL-negative MPNs, and define a correlation between the degree of angiogenesis in the bone marrow and JAK2V617F mutant allele burden. Methods: JAK2 mutational burden was determined by RT-PCR, BM angiogenesis was defined by MVDassessment using anti-CD34 for BM endothelium staining. The BM fibrosis was evaluated according to the Hanover system. The statistical analysis was performed with SPSS 17.0 software. 52 patients with newly diagnosed MPN were included in the study. Results: The distribution of the mutational burden was as follows: 26 patients with polycythaemia vera (PV), 16 patients with primary myelofibrosis (PMF) and 10 patients with essential thrombocythaemia (ET). In patients with PV the homozygosity was found prevalent in frequency whereas in PMF and ET the heterozygous variants were dominant. In all patients a significant positive correlations between JAK2V617F and BM MVD (r=0.306, p<0.002) and between MVD and fibrosis, (r=0.523, p<0.0001), was found.JAK2 correlated positively but borderline with fibrosis. The MVD and JAK2 burden were found in significant negative correlation with the BM cellularity (r=-0.405; p<0.002 and r=-0.431, p<0.0001, resp.). Conclusions: The significant correlation between JAK2V617F, BM angiogenic activity and the fibrosis marks out the JAK2 allele burden as a feasible parameter with prognostic significance for evolution and progression of MPN. Gercheva L, Zhelyazkova A, Micheva I, Zgurova N, Tzaneva M, Balatzenko G. CORRELATION BETWEEN JAK2V617F MUTATIONAL BURDEN AND THE DEGREE OF ANGIOGENESIS IN THE BONE MARROW OF BCR-ABL NEGATIVE MYELOPROLIFERATIVE NEOPLASMS. J of IMAB. 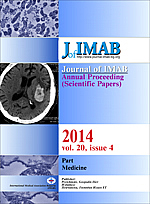 2014 Jul-Sep;20(4):526-530. http://dx.doi.org/10.5272/jimab.2014204.526. 13. Verstovsek S, Odenike O, Scott B, Estrov Z, Cortes J, Thomas D, et al. (2009) Phase I Dose-Escalation Trial of SB1518, a Novel JAK2/FLT3 Inhibitor, in Acute and Chronic Myeloid Diseases, Including Primary or Post-Essential Thrombocythemia/ Polycythemia Vera Myelofibrosis Blood 114: Abstract 3905. 21. Nangalia J, Massie CE, Baxter EJ, Nice FL, Gundem G, Wedge DC, et al. Somatic CALR Mutations in Myeloproliferative Neoplasms with Nonmutated JAK2. N Engl J Med. 2013, Dec 19;369(25):2391-405. [PubMed] [CrossRef].